“The price per barrel (WTI) increased $3.00 from last Monday to close on Friday to settle at $51.00 per barrel,” Casselano stated. Pump prices are rising across the Great Lakes and Central states with Ohio (+8 cents), Indiana (+8 cents), Missouri (+7 cents), Michigan (+6 cents), Iowa (+6 cents) and Kentucky (+4 cents) seeing the largest jumps in the region on the week. 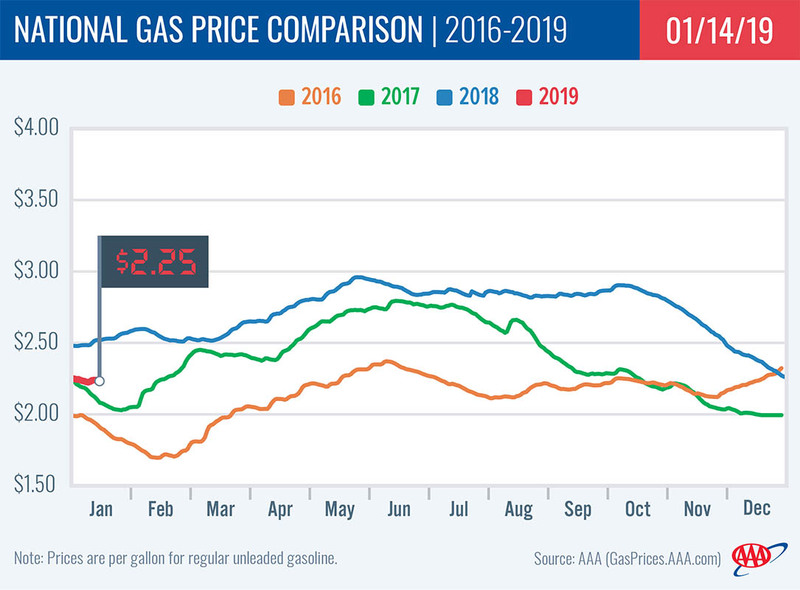 With these increases, many states’ averages have surpassed the $2/gal mark except for Missouri ($1.89) and Kansas ($1.97), though motorists can still find gas below the $2.00/mark in many states in the region. [320left]Compared to a month ago, gas prices are nearly 40-cents cheaper in the region. In fact the top states with the largest month-over-month difference are all of the Rockies states: Montana (-33 cents), Idaho (-32 cents), Colorado (-32 cents), Wyoming (-31 cents) and Utah (-29 cents). 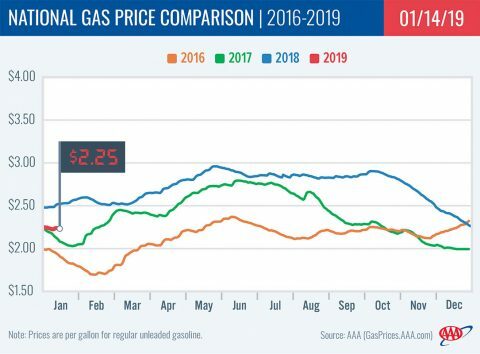 Pump prices in the West Coast region remain among highest in the nation, with all of the region’s states landing on the nation’s top 10 most expensive list. [320right]California ($3.28) is the nation’s most expensive market, followed by Hawaii ($3.26), Washington ($2.99), Alaska ($2.94), Nevada ($2.90), Oregon ($2.88) and Arizona ($2.59). 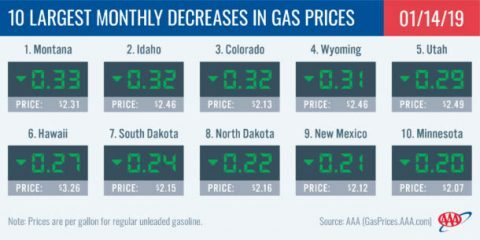 While expensive, prices are falling, with all state averages moving lower on the week: Alaska (-8 cents) and Washington (-5 cents) saw the largest drops. At the close of Friday’s formal trading session on the NYMEX, WTI decreased $1.00 to settle at $51.59. Although they ended down for the day, crude prices increased overall last week due to optimism that the trade tensions between China and the U.S. may be subsiding. Reduced trade volatility will likely help curtail stalled global economic growth that could have reduced global demand for crude. Moreover, with OPEC’s global pact with large non-OPEC crude producers (including Russia) to reduce crude production by 1.2 million b/d for at least the first six months of 2019 now in effect, the global glut of crude is expected to decline, helping to push crude prices higher. 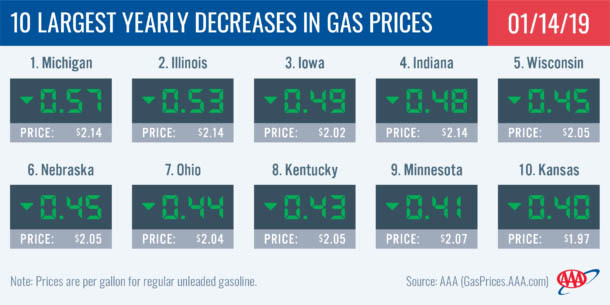 If crude prices continue to climb, motorists will likely see gas prices follow suit.